What is The Fox in the Forest like? The Fox in the Forest comes with 33 game cards in 3 suits numbered 1 to 11 and some scoring tokens. Players are dealt a hand of 13 cards. The remaining 7 cards create a draw deck. After determining start player, that player plays a card from hand face up on the table. His or her opponent plays one card face up on the table, following suit if possible. The highest numbered card ‘wins’ the trick. The player who won the trick is the lead player for next turn. As is common with trick-taking games there is also a trump suit revealed from the top of the left over 7 cards draw deck at the start of the round. After 13 turns the round ends and players score points depending on the amount of tricks won. First to 21 points wins. The first interesting thing about The Fox in the Forest comes from the odd-numbered cards (1-11) which each have a special ability that affects the game play. For example cards numbered 1 (the Swan) allows the player who loses the trick to become lead player instead of the winner of the trick. The Fox (cards numbered 3) allows the player to change the trump suit. Cards numbered 5 (the Woodcutter) allows a player to draw a card from the deck and then place a card from hand on the bottom of the draw deck. Etc. Hopefully you can see this is where the game gets interesting and gives the players a way to control what tricks to win and which to lose. So basically winning all of the tricks in the round isn’t that good. Winning a few isn’t good either. Your goal in The Fox in the Forest is to win 0-3 or 7-9 tricks in a round. This combined with the special abilities on the odd numbered cards give players a lot of options and decisions and sets apart from other trick-taking games I’ve played. The scoring system makes it impossible for players to have a bad opening hand of cards. It’s all about reading your hand and trying to figure out what cards your opponent has in order to get to the right amount of tricks in a round to get the most points. Reading your hand of cards and trying to figure out what cards your opponent has in order to get to the right amount of tricks in a round to get the most points. That is what The Fox in the Forest is in a nutshell and that’s also all there is to it. I’m not saying the game is easy. I actually think you could get better in playing The Fox in the Forest with more plays learning how to play cards in a way that you win or lose the right tricks to win. That said, there is a trend I saw in all of the games I played. After the first few turns in the round you have to decide if you want to score 7-9 tricks or 0-3 tricks, that is the only strategy choice you have. After that it is only tactical play to prevent you from scoring fewer points than your opponent. Trick-taking game lovers should absolutely try this game for the amount of originality it brings with the card abilities and the scoring system. The artwork is really good and each suit has its own flavor and colour scheme. Very well done. Production overall is also great. The rulebook even comes with a link to the background fairy tale where the game presumably takes place. There is a small personal gripe I have with the game. As a lefty I don’t understand why publishers only number the cards in the top left corner. There is enough room on the card to also add the same information to the top right corner. That way when a left-handed player fans the cards out they can actually see the important information too. In the end I have enjoyed The Fox in the Forest for what it is. 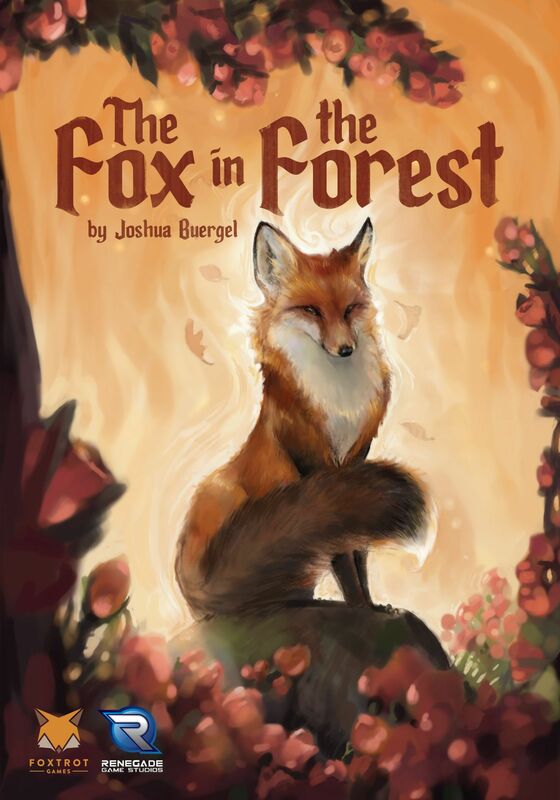 I do not think I will ever become a fan of the genre, but do think The Fox in the Forest has opened my eyes to the fact that trick-taking games can have more merit than I give them credit for. The Fox in the Forest required a few plays to see how you can use all the different actions on the odd-numbered cards. People familiar with classic trick-taking games in general will have no problem learning The Fox in the Forest.